Bear Update , bear proof garbage cans and Hunters you better watch out your being used for the developers! First thing. Please go vote for Chuck O’ Neal. He is the person who is doing the law suit against the hunt. This ends tomorrow and the money will go towards the law suit which we desperately need since we can’t make decisions in Florida like human beings. Chuck O’Neal has advocated for Florida’s natural resources for more than 15 years. An entrepreneur and lifelong Florida resident, Chuck has volunteered hundreds of hours educating voters and lawmakers on the importance of conserving Florida’s unique ecosystem. He organized “Speak up Wekiva,” which engaged community leaders and the public at large in the need to protect the aquifer and created greater awareness about the ill effects of groundwater pollution on people and wildlife. Chuck also leads advocacy efforts for the protection of the Florida black bear and played a vital role in the passing of the Florida Land and Water Conservation Initiative in 2014. His nonprofit of choice is the League of Women Voters of Florida Education Fund. They have been taken down but some smart person got these first. 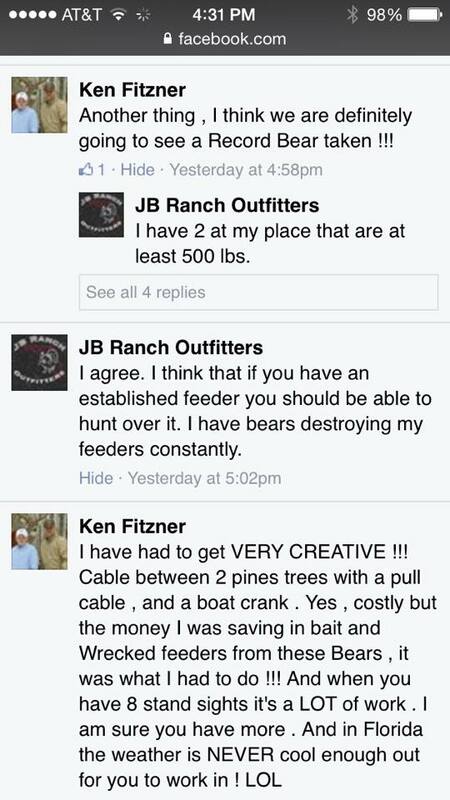 You can go to the Animal Activist Network and read them but essentially these guys are talking about how they are going to kill the bears with or without a permit. You can feel the foaming on their mouths. This was the original post that I saw in the TC Palm this morning from a local hunter. “For example, one protest features a picture of a bear and her cub that says: “Please don’t shoot my mom!” The protesters don’t bother to mention that it would be illegal to shoot any bear with one or more cubs. You also can’t shoot cubs, but this group seems to not want facts to get in its way. I also watched the video last week of the people speaking down in Ft Lauderdale. What i heard from the Hunters was they were the people conserving and they they knew what they were doing. But they don’t and this is why. Because if you the hunters keep this up there will be no hunting and you are being used to promote a bigger agenda. So who’s being emotional now? It’s been the job of the Pacific Legal Foundation to deregulate all the animals that are protected. They are now in many states but Florida is an easy target. Our legislators are dumb as bricks. We have the most protected species in the world “Developers.” There will not be any land to hunt on because it going to be full of wall marts,shopping centers, no lot line houses. There will be no hunting because there will be no place to hunt. 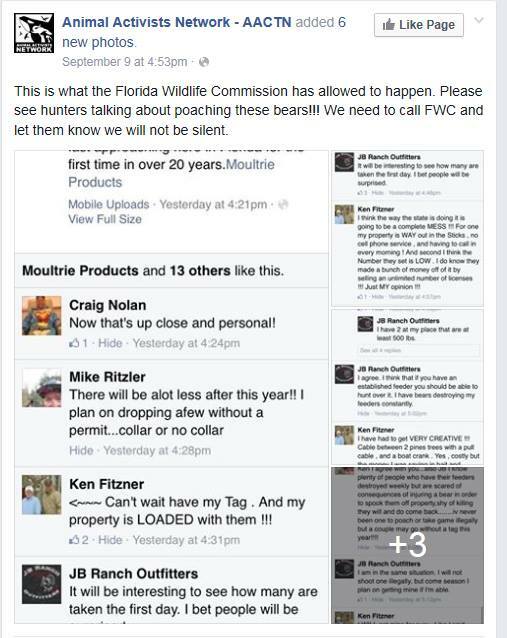 We have plenty of hunting in Florida and I don’t think you’ve heard an outcry like this. Because we know two things and in your heart you know it too. 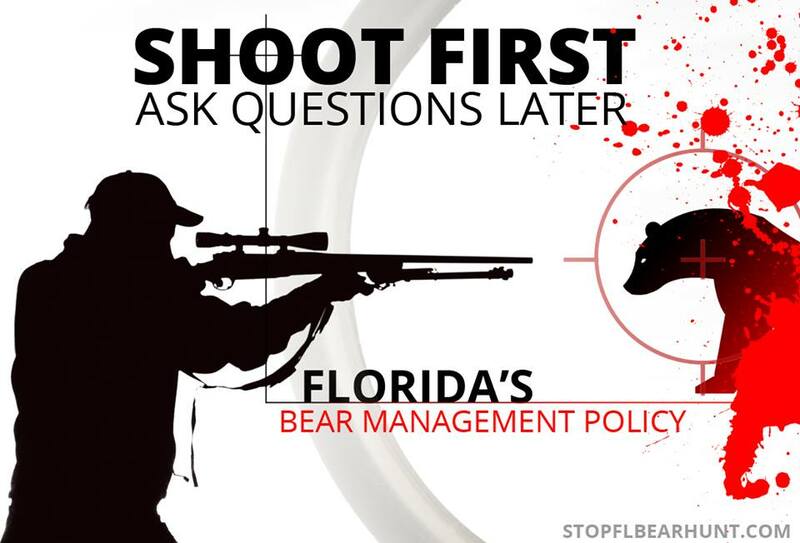 Floridians cannot be trusted to hunt bears. forgetaboutit We understand the lessons of the past when they were decimated. When we hunt the bears the panthers will be next Then the land will be free to sell and develop and we will have nothing. OUR Florida will be gone. You wanna hunt dudes save up your mileage for flights up north because there will be no hunting here. Don’t allow your self to be used. Settle down. When I spoke a representative from FWC last year the plan was education. Period end of story. The issue was humans feeding the bears. Sorry about the formatting my wordpress is psycho this morning. The bill, sponsored by Rep. Jennifer Sullivan, R-Mount Dora, and Rep. Jay Trumbull, R-Panama City, comes as the Florida Fish and Wildlife Conservation Commission prepares to give formal approval to a black bear hunt this fall — the first such hunt in two decades. So in Florida we don’t fix problems like most logical people because if the issue is people leaving out garbage then lets Fix it. I did also go on to explain what a third degree felony is and how absurd is that? The point was there were people that needed to be educated and the people who refused to be educated should be fined and that would would speed up the education process. WHEN ARE WE GOING TO STOP BEING THE JOKE OF THE NATION? Then later down the line I wrote this. The downlisting did not come from Florida but out of state from a group that has been working on this since 1973 and have plenty of money. States Rights people. Don’t let fat cat out of state interests mess with our state. So this is the story. These peoples jobs are to deregulate everything and then the developers come in and build build build. You want to hunt? There won’t be any hunting when they are done. You’ll be taking that trip up to Maine or NH to do your Bear Hunting. So I’m just asking you to consider this since you consider yourselves conversationalists. You also have plenty to hunt and to eat. I’m not anti hunting for food and you can hunt for hundreds of animals in Florida. You can hunt your brains out. OK I know long. So sorry but I want to get it all in one blogpost so I can tweet. So here are the important updates so please go to the links I am providing and follow those people. This is a very important event. No matter what we need to get Bear Proof Garbage Cans out there. This is our work to be the voice of reason in the hunting season! Here’s one way you can help. The Seminole County Commission will be having a meeting with the FWC on October 13th. Yes and support the right to ARM BEARS!